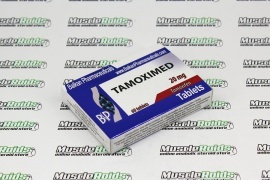 Vermodje Tamoxiver is a powerful, non-steroidal antagonist of estrogen. The mechanism of their anti-estrogenic effect can be described as occurring to bind to estrogen receptors, blocking the action of estradiol. Complete blocking of estrogen receptors having a significant decrease in the chance of negative effects such:gynecomastia, water retention, high blood pressure HBR. Vermodje Tamoxiver the trade name of the active component - tamoxifen citrate. The producer is the company Vermodje from Moldova.